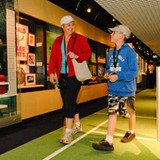 Lovers of sport, there is heaven on Earth, and it's called the National Sports Museum. Filled with a stupendous range of engrossing displays and amazing memorabilia, your senses will be so overwhelmed that it's likely you'll start hyperventilating. This is the place to discover everything you need to know about Aussie sport, from footy, cricket and soccer to cycling, netball and baseball. Along the way, you'll come across baggy greens, Olympic medals and premiership trophies, as well as a wonderful collection of photos. Admission costs $15 for adults, $11 for concession, $8 for 5-15 year olds, $50 for families (two adults and four children) and nothing for under-5s. If combined with a MCG Tour, the price is $30, 23, $15, $60 and nothing respectively. To plan your visit, click here. To find out what events are on, click here. And for more information, check out the image gallery and FAQ.